To change the song to a different drum kit altogether, choose Change Drum Kit… from the Song menu, or click on the kit's name in the drum kit palette. You will then be prompted to select a Doggiebox drum kit file. As mentioned earlier, a Doggiebox song file does not contain copies of the actual sounds but rather a pointer to a Doggiebox drum kit file which does. Only the names of the instruments are stored in the song file. When you open a song, its drum kit is automatically loaded and the instruments are re-associated. If you decide to change the drum kit used by an existing song, and the new drum kit contains different instruments (or ones with differing names), Doggiebox will ask you how to map the drums used in the song to those in the new kit. 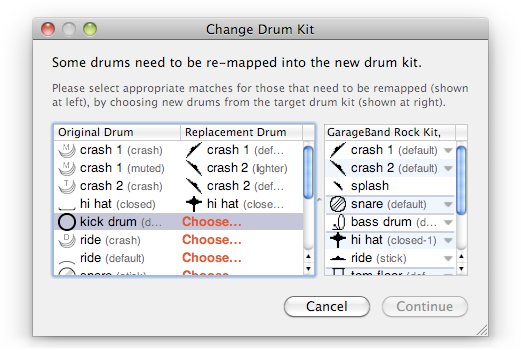 The drum kit reconciliation dialog. Four down, several to go. The table on the left lists the drums currently used in the song, along with choices that have been made for their replacements. The table on the right shows all the instruments in the new drum kit. To assign a mapping, select a row in the left-hand table, then choose an instrument from the right. To complete the process you must make assignments for all drums marked Choose…, then click Continue. After doing this once, Doggiebox will remember your decisions and automatically fill them in as default choices in the future.